We provide picture day services for youth sports leagues and dance troupes throughout the Maryland, Delaware, Northern Virginia region. Our programs are focused on value for parents, a generous rebate for the league, and lots of free extras! Our low cost package fits the needs of many parents, and is sold by many of our competitors for much more. What do I need to bring to picture day? A completed order form, with payment, uniform and a bat/ball/stick. Can I pick the package later? No. You must pick on picture day - but don't worry, if you want more you can always re-order. Contact us at 410-212-8753 or sports@buchanan-studios.com. Do you post the images online? No. For privacy reasons, images are not posted unless specifically requested - and then only with a password. We'll either reshoot it, or refund your purchase price. There was an error in my order, what do I do? How long do orders take to come in? Usually about 4 weeks from picture day. Cash and checks can go in the order envelope, credit cards accepted at the check-in table. We missed our team photo, can you photoshop my child into the group? Probably not. We can try, but no promises. We'll coordinate with the league to pick a rain date - check with your league officials. How many photographers will you bring? It varies from league to league based on the schedule, but usually, it's two photographers, plus a table runner to coordinate. How much will our league make in rebates? We allow our partner leagues to select their rebate amount. Usually between $3 and $5 per package. How long does it take to shoot each team. Depending on which sport - between 15 and 30 minutes per team. How do parents get the order forms? 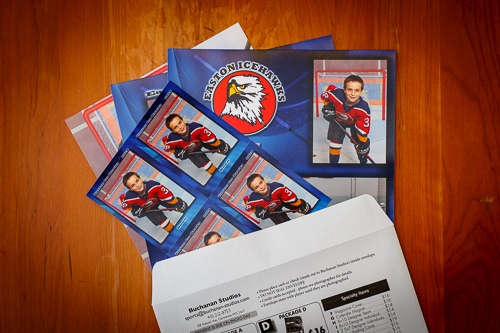 About 2 weeks before our scheduled picture day, we'll send blank forms to the league coordinator for distribution. One of my coaches forgot to hand out forms beforehand, will you have extras? Absolutely. Just see the table attendant on picture day. How long do the orders take to come in? We'll work with you to schedule a rain date in the coming weeks. Do you offer make-up sessions? Yes, usually about 5 weeks or so after the original picture day we can do a make-up and retake session.